The first written reference to the town dates back to 1255 and concerns the granting of rights to extract gold, silver and other metals to German settlers. They also obtained town rights and the settlement subsequently developed, based on an older Slovak village and a new community of Saxon miners, descendants of today’s Carpathian German national minority. The settlement began to form around what is now the oldest preserved building monument in the town, the originally Romanesque parish Church of St Mary. This became the central object of the fortified area, the Banská Bystrica Town Castle, consisting of the Church of the Holy Cross and the separate buildings of Matthias’ House and the Old Town Hall. The dominant features of the castle area were the towers of the entry gate and the parish church. The reconstruction that took place in the end of the 20th century indicated the system of fortifications which once existed in the southern and western parts of the area, as well as the moat in front of the barbican. The lower south west end of the rapidly growing Gothic town developing around the Via Magna trade route was delimited by the hospital Church of St Elizabeth and Monastery at the start of the 14th century. The period between the 15th and 16th centuries is considered to have been the golden era of the town. Krakov entrepreneur Juraj Thurzo purchased almost all of the mines in Banská Bystrica and, with the intention of re-establishing a prosperous enterprise, joined with the banker Jakub Fugger of Augsburg in 1494-1495 to found the Thurzo-Fugger copper company that flourished for more than 50 years. The administration of the company was based in Thurzo´s House with its Renaissance graffito facade and pronounced attic. Today Thurzo´s House is the seat of the Central Slovakia Museum. On the opposite side of the square stands Benický House, which came about as a reconstruction of two older Gothic houses from around 1660 and has an arcaded loggia facing the square. Other burgher houses deserve attention because of Renaissance modifications and details. Many of them were the works of di Pauli construction family. Burghers began to build fortifications in the 16th century. Works on walls with a relatively complicated plan continued even up to the start of the 17th century. Older fortification buildings were also included in the system. Four gates were built on main roads. However, only some portions of walls and seven bastions hawe been preserved up to this time. Three bastions form part of the castle area. The dramatic period of the 16th century is mostly linked to the miners´ rebellion of 1525 that began directly in Banská Bystrica and spread quickly to the whole Central Slovakia mining region. Even though it was suppressed it represented one of the biggest demonstrations of social resistance against oppression during feudalism. The Reformation quickly gained followers in the German community, and by 1539 all of the churches in Banská Bystrica had fallen into the hands of the Evangelicals. The most remarkable feature of the sloping square, the Clock Tower, was built in this period. It is deflected from the vertical by 68 centimetres and at the present time it serves as a lookout tower. During the period of estate uprisings the Diet of the Kingdom of Hungary elected Gabriel Bethlen as King, Duke of Transylvania and leader of the anti-Habsburg uprising. The election took place at 8 Dolná street in 1620. The following Counter Reformation resulted in the building of the Roman Catholic Church of St Francis Xavier. It is a copy of the Jesuit Il Gesu Cathedral in Rome. After the establishment of the Banská Bystrica bishopric in 1776 it became a cathedral. The building of the former Jesuit College, erected in 1695 and rebuilt at the beginning of the 19th century, was originally part of the church. The Baroque plague column, built in gratitude to the Virgin Mary from 1719, stands in front of the church. The Bishop´s Palace at 19 SNP square was built in the Classicist style in place of two late Gothic houses. After a fire it was renovated as a representative building in 1787 and now serves as the bishop´s seat. Štefan Moyzes, the Catholic Bishop and first chairman of Matica slovenská, also resided in this building. At the end of the 17th century the declining copper mining industry was replaced by iron mining. The number of craftsmen grew, and during the 18th century the town became the most important centre of crafts in Slovakia. Many craftsmen’s workshops were later changed into factories. A lot of handicraft products found their outlet at the Radvaň Fair, traditionally organised from 1655 right up to the present day. Banská Bystrica became the seat of the county at the end of the 18th century. 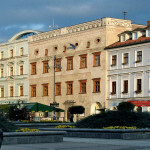 The county had its residence in the large building at Lazová street. The building is now used for the purposes of the State Scientific Library in Banská Bystrica and it has a modified Renaissance loggia. The Calvary was built on the Urpín Mountain above the town at the end of the 17th century. The road to the Calvary runs through the lime-tree alley. On the site of the original wooden ‘articled’ church on Lazovná street is now the Evangelical Church built in 1803-1807. It is one of the most remarkable Classicist monuments of Banská Bystrica. The Slovak National Uprising was a significant chapter in the modern history of Banská Bystrica. The armed insurrection of the Slovak nation against the German Nazi regime broke out on 29 August 1944. The Monument to the Slovak National Uprising (SNP) in Banská Bystrica, a modern construction designed by Architect Dušan Kuzma in co-operation with sculptor J Jankovič, was built at the edge of the town’s historic core in 1969. The emotive sculptural structure consists of two unequal concrete segments connected by a glass bridge. An exhibition of heavy arms, including Štefánik’s armoured train, used during the uprising is placed in the middle of greenery. Significant architectural elements that originated in the 20th century on the site of the demolished town walls and many charming villas built at the turn of the 19th and 20th centuries add to the local colour. The villa of famous painter Dominik Skutecký at 55 Horná street is open to the public. The villa was built after 1896 and preserves a permanent exhibition of works of art created by Skutecký, who was closely connected with Banská Bystrica. Banská Bystrica was declared a Town Conservation Reservation in 1955 thanks to its preserved historical core and valuable architectonic complexes.